What a wonderful word is Nattaginni! Just one little part of the remaining legacy of 40 000 years of culture in Australia. Unfortunately, these days the word is a largely stranded remnant of the culture the produced it, but I’m glad the word at least lives on. It lives on in the form of an alpaca farm of all things – Nattaginni Alpacas. I was commissioned to make an image of this charming building. Not the main house, but a second building on the farm, known as Nattaginni Cottage. It wasn’t just a commission though, I had my own reasons for spending the time on this image. The ‘client’ is a great mate, and I had enjoyed staying at Nattaginni on numerous occasions while he lived there in the cottage with his family. I worked from photographs he sent me for the cottage and it’s garden. I was keen to place the cottage in it’s broader environment, since it was so nice to spend time on the back verandah, watching the cows roam the green hills, flanked by Bunya peppered rainforest remnants as the tropical heat makes big white cumulus rise above the horizon. (Bunya – now there’s another good word.) Just as well I’d made some small sketches on one of those occasions, so I had that to refer to in order to create the background. 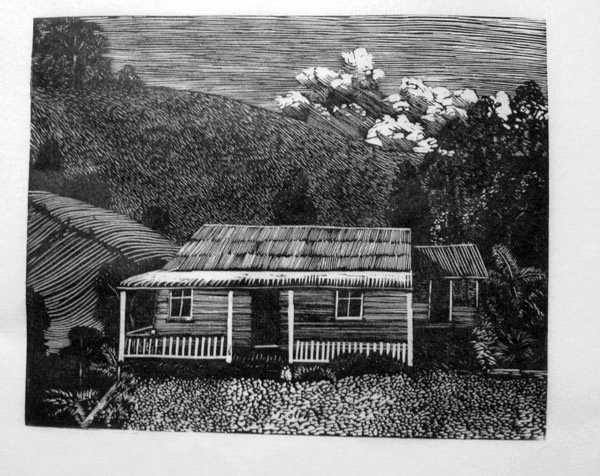 I printed ‘Nattaginni Cottage’ at Megalo Print Studio on Kozo extra light paper from a commercial maple block. Above is the broadside print that I made a little while back with the assistance of Ampersand Duck. 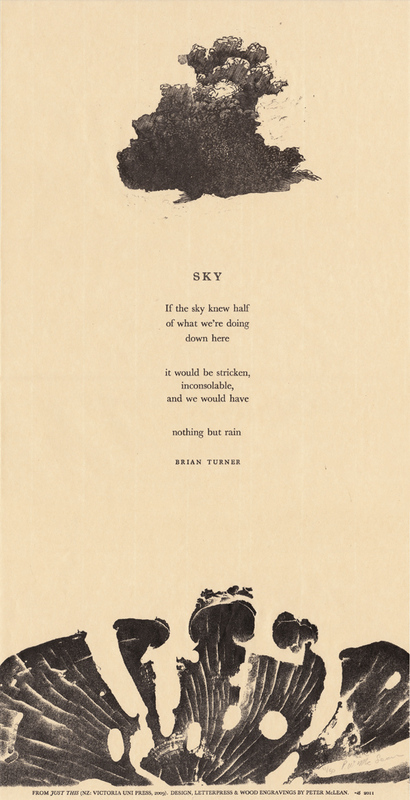 It features a poem by Brian Turner set with lead type along with a wood engraving cloud and the earth represented by a relief print from a section of borer attacked Acacia trunk. The broadside is now available to order online from Ampersand’s store here. 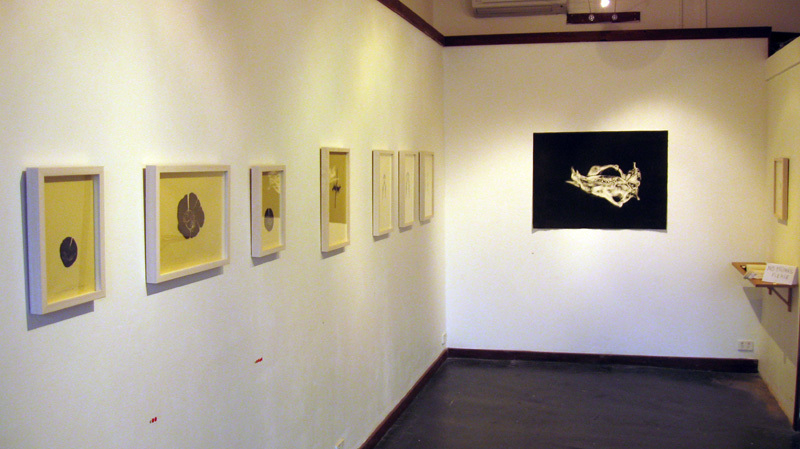 Preserved Disintegrations was a great success at The Front Gallery, but alas the show is all packed down again now. Here’s a few gallery shots for those who weren’t able to make it. One of the special projects that will be a part of my upcoming show will be a letterpress broad side I’ve just printed. 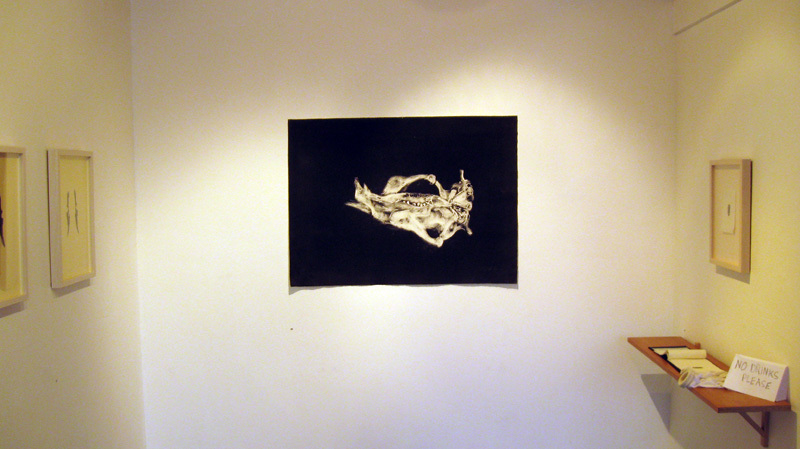 One of the awards I received when I graduated from ANU school of art in 2009 was the Ampersand Duck Broadside Residency. 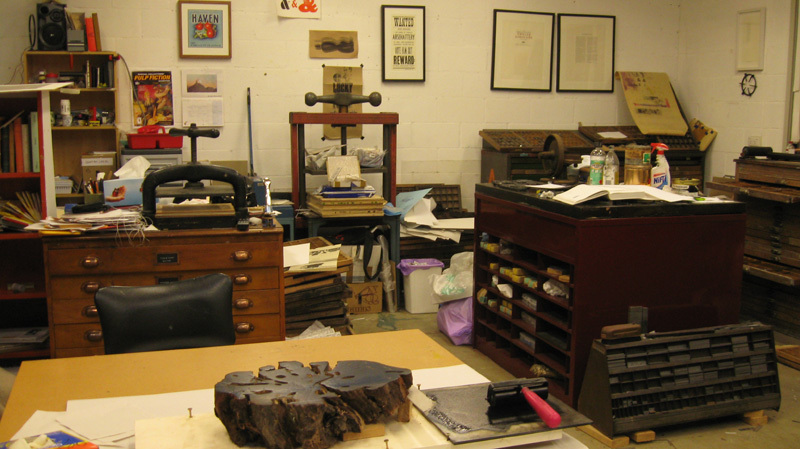 This gave me the chance to work with Ampersand (aka Caren Florance) to produce a broadside. Broadside (or broadsheet) historically refered to any single sheet of paper printed with text on one side – ie, the original poster. These days broadsides are fine art productions using a combination of image and text, often poetry. The poem I chose is called Sky by New Zealand poet Brian Turner. It ended up quite a complex project, with the image made up of a relief print from a borer eaten section of Acacia trunk, a moderate sized wood engraving (on a commercial birch block), and the type. The result however looks elegant and simple. 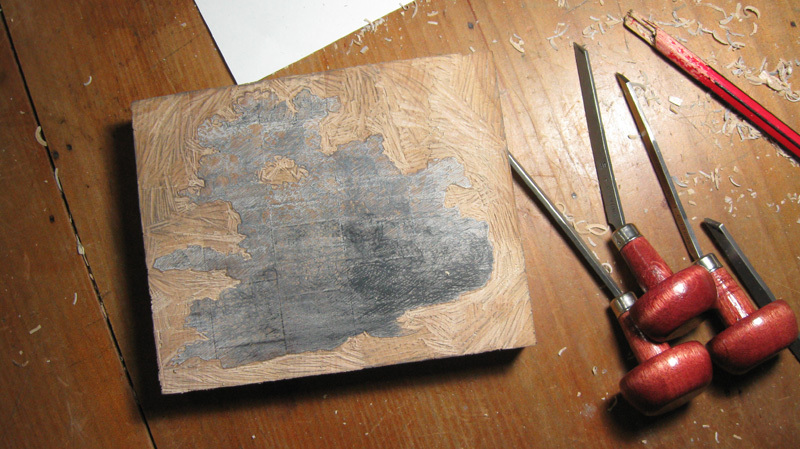 Below is the carved 4″ x 5″ block and the engraving tools. and a proof print. The block got significant changes between this print and the final version. My piece of acacia trunk, lovingly sanded smooth and ready for hand printing in Caren’s lovely studio – look at all that nice woody and printy stuff! 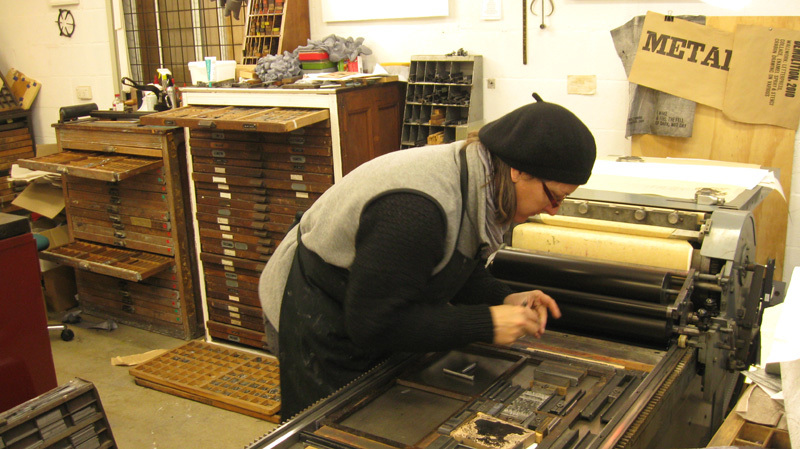 Caren fine tuning the type and the wood engraving on her press. To see some more images of the process, including the finished print (and info on how to buy one!) have a look at what Caren said about it here. 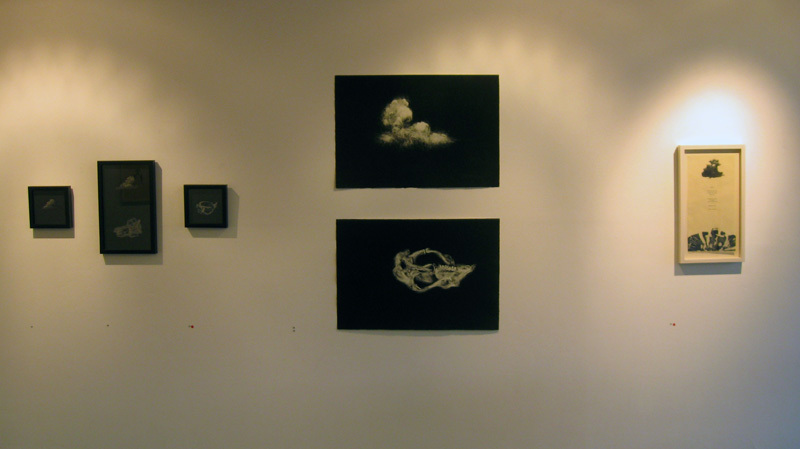 Or better yet, come along to the show at The Front Gallery in Canberra. I know the blog has been pretty quiet of late, and I apologise to regular readers. I hope a few of you at least has persisted and check back in now and then, secure in the knowledge I’d eventually get back to posting. Rest assured I have been busy, in fact blog posts are probably somewhat inversely proportional to general business. 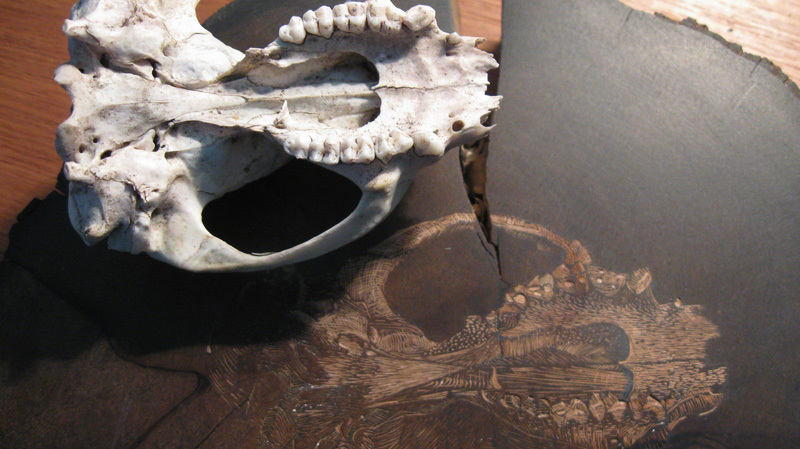 One recently emerging project is large monotypes, continuing on the themes of clouds and skulls. 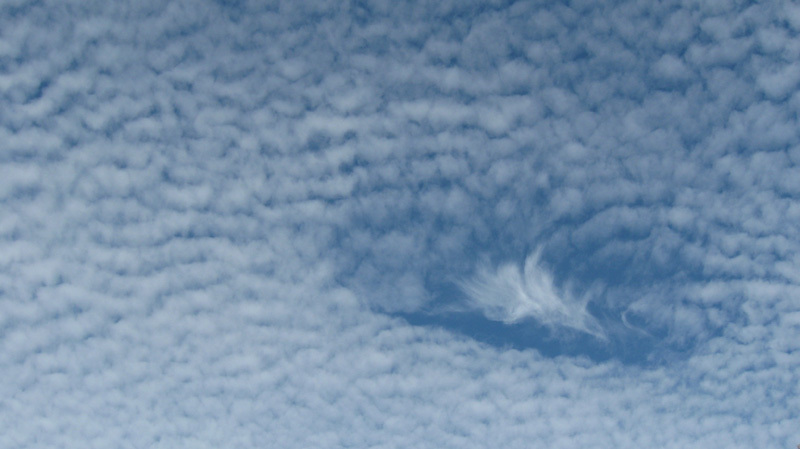 I think I have written about skulls and bones here before, but why clouds? For a lot of the same reasons really. Clouds are ephemeral of course, coming and going with every one unique, and yet adhering to recognisable forms. And where do these forms come from? The interactions of physical materials (water vapour, ice crystals etc) and nature’s processes (convection, condensation etc.) all operating beyond ordinary perception leaving us these fleeting objects in the sky which often promise but don’t always deliver life-giving rain. 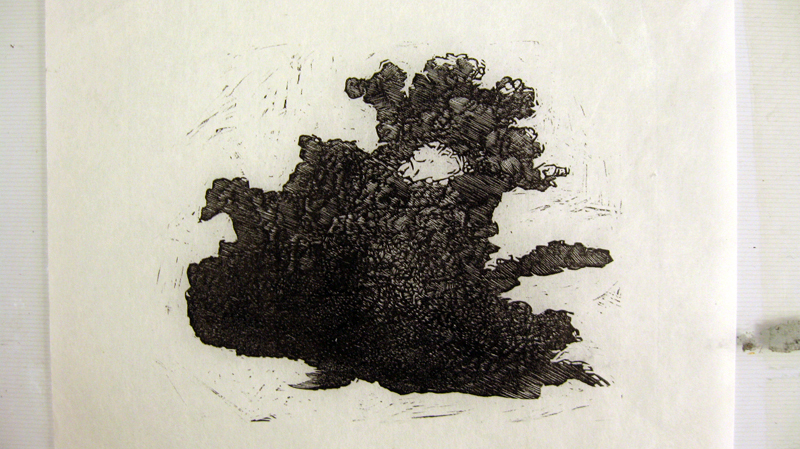 Monotypes are a form of printmaking, though unlike most print forms can not be made as multiples. Flat plates of metal, glass or perspex form the matrix on which the image is drawn in stiff ink. 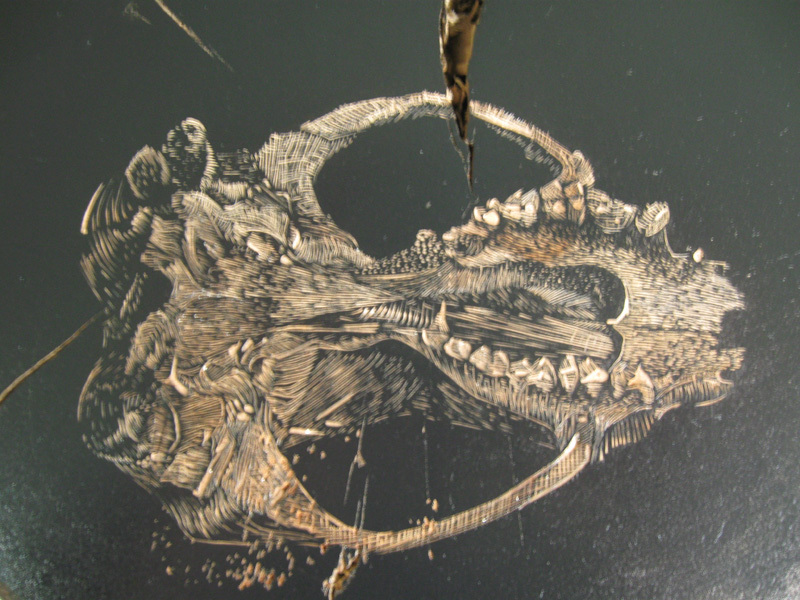 The positive image can be applied to the plate using brushes, rags or a range of implements, or ink can be applied to the entire plate with a roller and a negative image drawn by removing the ink through similar means. This second approach is the one I have been using. While monotypes can be printed by hand, the best results are achieved by passing the plate and paper through a press in a similar way to an etching. I’ve been using the Hilton electic press at Megalo Print Studio and Gallery in Canberra, which is just big enough to allow me to print up to a full sheet of Hahnemuhle paper edge to edge. Lake Geoge, near Canberra has been getting a lot of attention lately, and as I’ve written about the lake here before I thought it might be a good way to bet back to blogging after I’ve left it dormant for a while (apologies to my regular readers – you know who you are!). What has to be the best public art I’ve seen in a long time appeared on the lake recently and has been drawing a lot of attention from passing motorists. 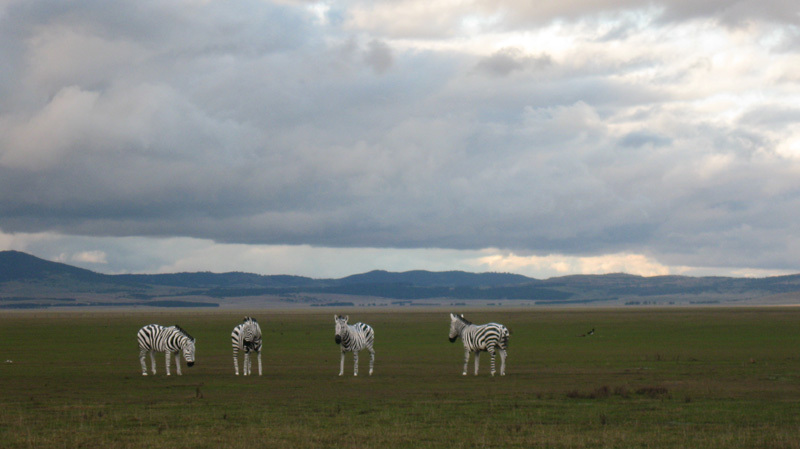 Four life-size and realistic sculptured zebras graze the lake bed in front of one of the rest stops. They were installed by artists, Alan and Julie Aston. It’s a bit old news now, but earlier in the year Weereewa-A Festival of Lake George, was held on and around the lake and in the nearby town of Bungendore. I was involved in a couple of events. 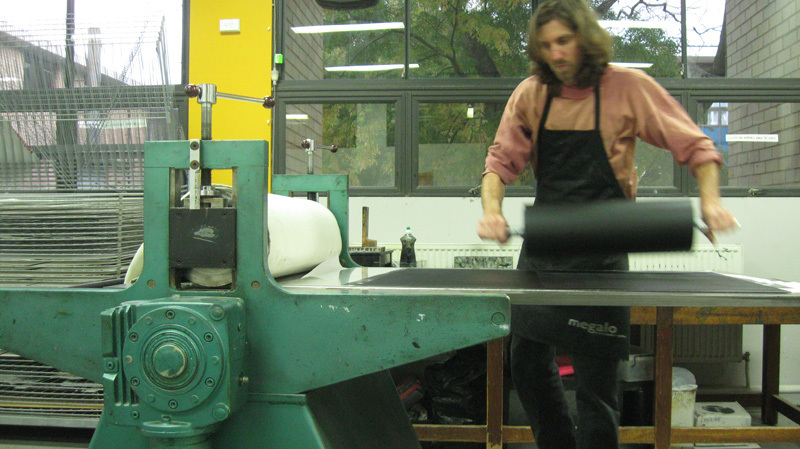 Megalo Print Studio and Gallery mounted an exhibition of hand printed tea towels titled “windwash”. 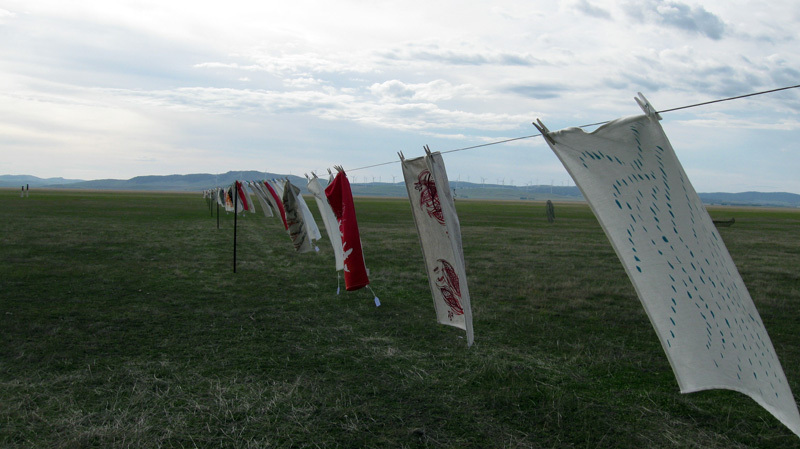 I screenprinted a couple of designs which contributed to the installation of work from many members which stretched some 200 meters out onto the dry lakebed. 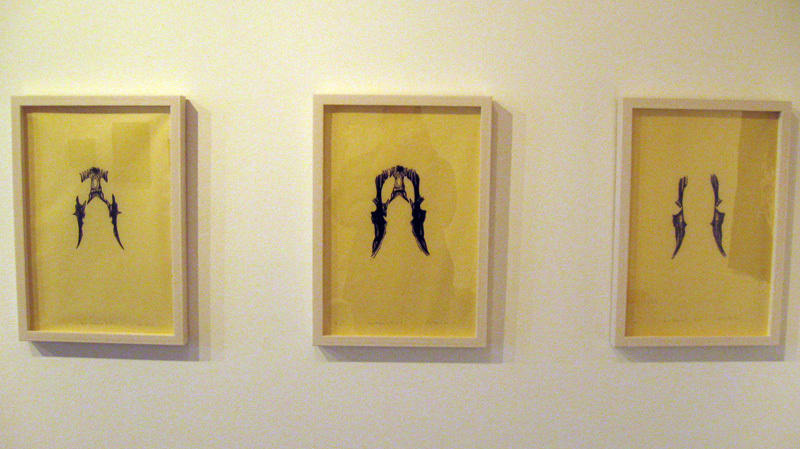 Finally, another festival event was a “works on paper” exhibition and prize. 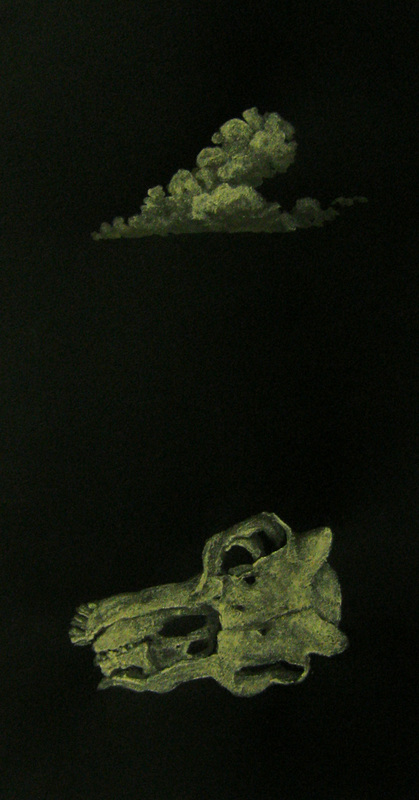 After spending some time exploring the lakebed one afternoon, and collecting materials I made a drawing using powdered bone and sediment from the lake on black paper, which won me a joint first prize! After a very busy month, I’ve finally had a run of a few days at home. 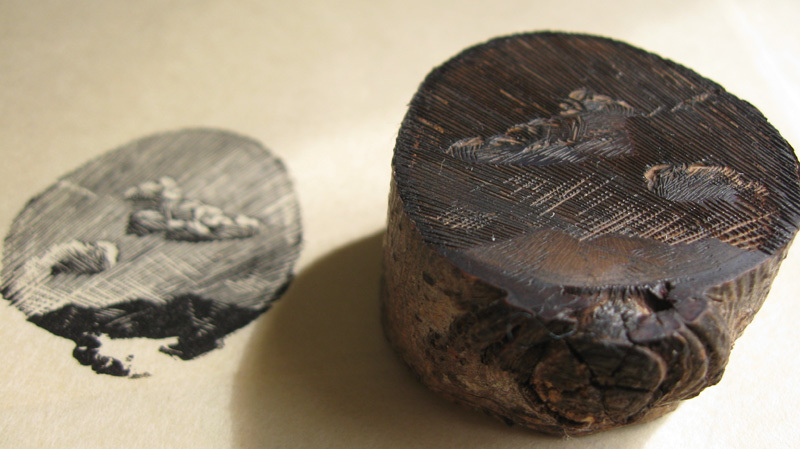 Apart from a lot of gardening, I’ve also made a couple of new wood engravings. Firstly a tiny landscape carved on a small round of pear wood, about an inch across. After that warm up, I moved onto something a little more ambitious. 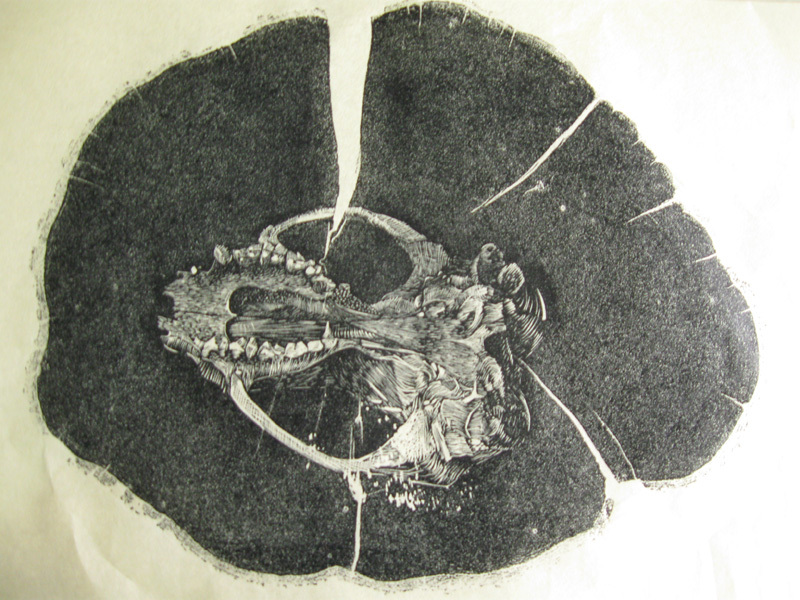 An image of an animal skull on a large round of hawthorn. The block is about 20cm long and the image itself about 10cm I guess. I’ve been carving it over the last few days and started proofing today. I’m still quite undecided how I want to print it for an edition. Printed as dense black, the engraved image looks great, but I think the shape of the block becomes too dominating, so I’ve been experimenting with lighter printing. Getting the balance right and the prints consistent will be something of a challenge though. Anyway, here’s some images. 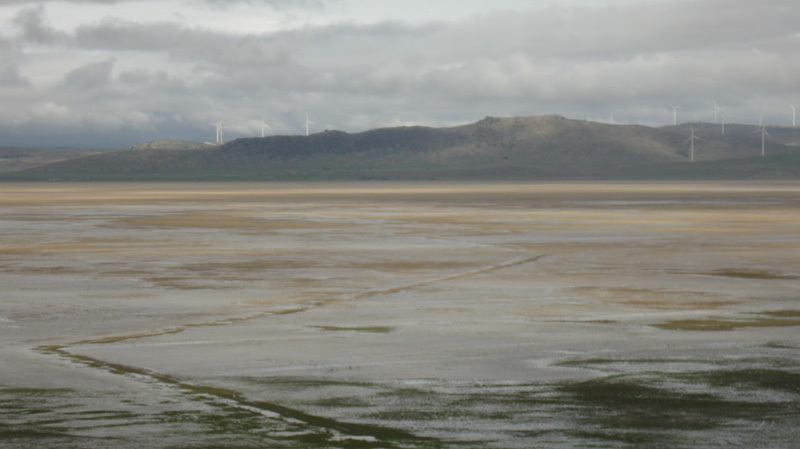 I posted pictures just recently of a very dry Lake George. The pic above was taken yesterday, after Canberra recorded 104mm of rain over three days. The last time Canberra got rain like that was 2002. Still a long, long way to go before anything like a lake reappears, but after being dry for so long, this giant puddle was enough to attract a steady stream of motorists to the lookout. If only it would rain here ! Yes, that’s the moon in there.